So it works like clockwork; twice a year, I get the worst sinus pressure on the planet and I want to just put myself out of misery. This summer to fall transition has been pretty easy on me THIS year, but in general I’m hopped up on Claritin or some sort of Sudafed type relief to be able to breathe and live a normal life. I generally like to stay away from having to take OTC medicine if I can control it, but sometimes I just cannot take it or I need more help and want to be able to sleep without having tissues stuffed up my nostrils to catch that rebellious post nasal drip / runny nose situation before it ends up on my pillow. I know, gross. SO, I am always on the look out for a quick remedy that isn’t in pill form. I had the opportunity to learn more about Simply Saline when I attended BlogHer13 this past summer, when my sinuses were still at bay. I was given some samples to test out and I kept them within arms reach for the impending doom that is my sole con of the fall season. It’s pretty great. I mean, I’ve used the Neti Pot many-a-times and it got me out of plenty of pickles when sick or just stuffy; it really does the trick! My one qualm with it though, is waiting for my water to boil, sanitize and then cool off enough to pour down my nostril. So, I waited for my sinuses to start acting up and went straight for the Allergy & Sinus relief formula. Man, did it help me out of a bind! It’s great to be able to reach over and get almost instant relief without putting a bunch of chemicals up your nose; just purified water and sodium chloride. For those of you who didn’t pay much attention in chemistry class, sodium chloride is straight up salt. The same stuff you sprinkle on your pop corn, is helping relieve your tortured face from its prison of pressure! This stuff is made with Arm & Hammer baking soda; the same stuff I use in the shower to exfoliate my face and bake cookies with! It’s super fast relief, without drugs, but safe enough to use if you’ve taken an allergy pill and need to flush out those passage ways quick stat! It’s so safe, they even have products for babies and children. I can’t say that I can’t wait until I have another allergy / sinus flare up, but when and if I do, I look forward to trying out the Nighttime Formula that has Eucalyptus in it! Glorious will be the day that I can sleep through a fall night without a tissue plugging my nose up for protection! I must admit that it was a bit saltier than I was used to, however it really cleared me up and I didn’t have any issues with my breathing the rest of the day. The fact that I’m exposed to outside elements daily, because I run outdoors a lot on top of walking to and from work, I need something to work quickly and nip pressure in the bud. 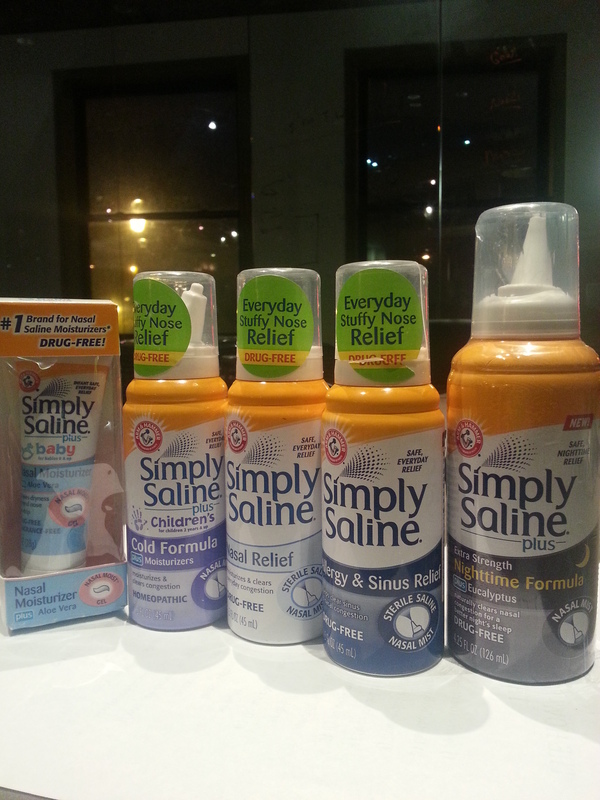 The Simply Saline line is the perfect answer to those issues. It’s also a great partner with some natural remedies or with OTCs if I’m in a pinch. Try it for yourself (obvy check with your doc first). Have further questions on the Simply Saline products? Hit me up and comment below!